Quick to install, highly portable and great value. 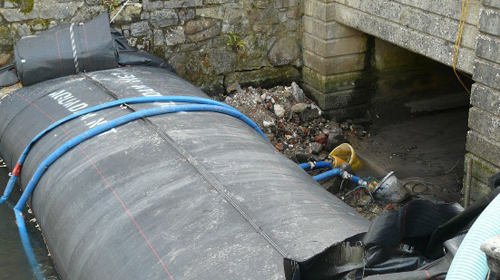 AquaDam is a superb cost cutting tool for culvert inspections and repairs. Ideal for SSSI. If you need to get in, inspect and move on to the next culvert. Our easy to use AquaDam Re-roll Set makes for a very quick turn around between culverts. Generic RAMS & design calculations provided. Water filled means a 24 tonne temporary dam weighs just 60kg when empty! (Speedy 10/90 - our best seller) All dams in our Speedy range will fit onto a single standard pallet. The easy to use AquaDam Re-roll Set makes re-rolling ready for the next for inspection very quick. The optional Pump Flow Splitter allows single pump installation and is a great tool for easier operation.